Jinah is an associate attorney at the Collins Law Firm who focuses her practice in commercial transactions, commercial litigation, banking and finance, where she represents lenders, manufacturing companies, developers, and businesses. Jinah has experience assisting clients in complicated commercial lending transactions, mergers and acquisitions, commercial leasing, and general contract drafting and negotiations. Her practice also focuses on counseling businesses in everyday business matters, as well as representing clients in breach of contract and shareholder disputes. 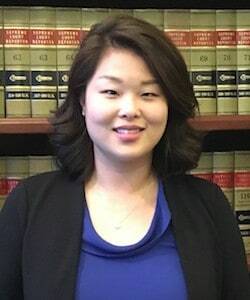 Jinah received her juris doctor from the Chicago-Kent College of the Law, where she received a business law certificate and dean’s list honors. She was an associate editor for the Journal of International and Comparative Law and served as the vice president of the Asian Pacific American Law Student Association. She gained valuable experience serving as a judicial extern for the Hon. Pamela Meyerson in the Cook County Circuit Court Chancery Division, interning at the Chicago-Kent Tax and Probate Clinic, and clerking for a prominent workers' compensation and civil defense law firm in Chicago. Jinah is an active member of the Chicago Bar Association and DuPage County Bar Association. Prior to law school, she graduated from the University of Illinois at Urbana-Champaign with a bachelor’s in Political Science, where she spent a year studying abroad in Seoul, Korea to concentrate on advanced Korean language and Southeast Asian politics.